I just came across your web page for the first time this afternoon. 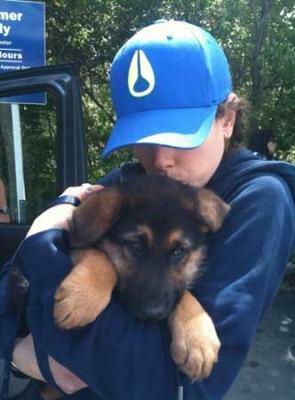 The attached picture is of the day I met my brand new, very, best friend... Griffin. He is only 9 weeks old and he has my heart, I love him so much already. He is doing amazingly well and I have enrolled in puppy class because I have a feeling he has enormous potential. I will be sending you photos monthly to show Griffin's progress. Griffin is awesome! He will be such a handsome boy and I would lay bets that he will be the best thing to ever happen to you. 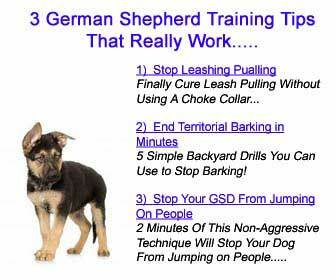 Read all you can about the GSD and be his pack leader! Good Luck and Enjoy! What a beautiful puppy Griffin is.Good luck to both of you in your training classes.You and Griffin are going to have so much fun.HUGS!